Spreadsheets are an inexpensive and widely used solution. However, as experienced users know, spreadsheets are literally ‘Islands of automation’. Consequently, it can be a challenge to integrate spreadsheets models for your resource plans, with spreadsheets for your growing schedules. Over time, the spreadsheet simulation begins to deviate from the actual plan. Once that happens, there is a growing risk that poor information will result in lost production or missed delivery dates. Farm Production Manager provides a powerful resource planning interface that allows you to specify resources unique to your process and link them to specific Milestones in your growing schedule. Resource requirement simulations are automatically synchronized with your schedules, including status changes if you also do Recordkeeping. You don’t need to worry about formulas or double entry of your progress data. Budgets based on actual schedules are always up to date with your latest changes, reflecting the current status of your crops, whether growing in greenhouses or in the fields. Using Farm Production Manager’s Milestone structure, you can align resource requirements very precisely in terms of timing and quantity, with specific Milestone events. These Resource Profiles are created once for each product you grow. When a growing schedule is created, the Milestone schedule quantities and dates are extended through the resource profile to create a time-phased view of resource requirements that is always aligned with the schedule. The resource requirements are automatically adjusted for the status of schedules. For example, when the Recordkeeping transaction indicates that the Tray 1 Milestone process is complete, that portion of the resource requirements no longer appears in the output. 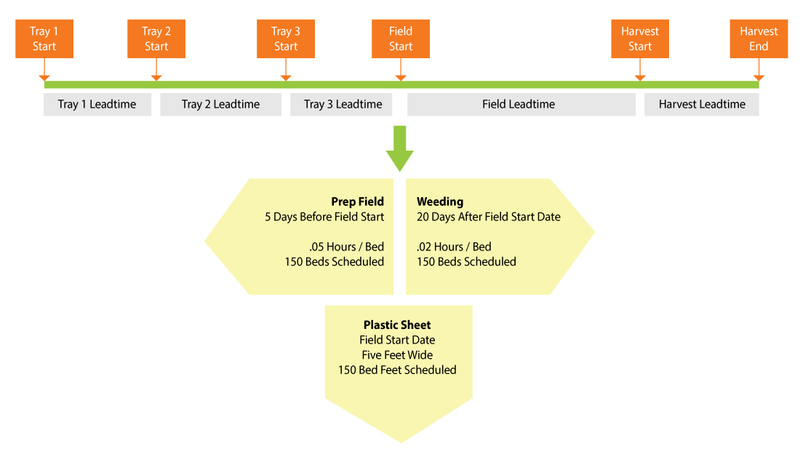 You can create a resource for plastic sheeting and associate it with the Field Start Date and the Total Bed Length planted. The total requirement will be calculated using the system value for ‘Total Bed Length Planted’. You can create a resource for weeding labor, associate it with either Field Start or Harvest Start and add offset days so that the load is offset from the Milestone date by a specific number of days.